At the Electronic Arts press conference, Battlefield 3 finally got its release date and multi-platform beta details. The Swedes are never late. They arrive with a new iteration of Battlefield precisely when they mean to. EA announced today that Battlefield 3 will release into the wild on October 25th on the PC, Xbox 360 and PS3, and that they will organize a massive beta program in September for all its platforms. Get your modem waxed. The catch is that to ensure your place in the beta now, you have to buy a Medal of Honor Limited Edition, but that restricted may be lifted once the beta revs up. As most shooters, the game will feature a campaign and a substantial online multiplayer. DICE used its new Frostbite 2 engine to make it look so purty, so that should make PC gamers happy. 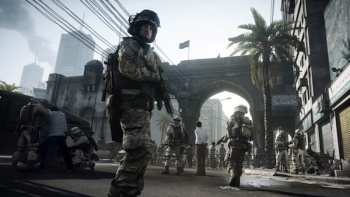 In addition, PC players will be able to play against 64 players simultaneously in Battlefield 3.